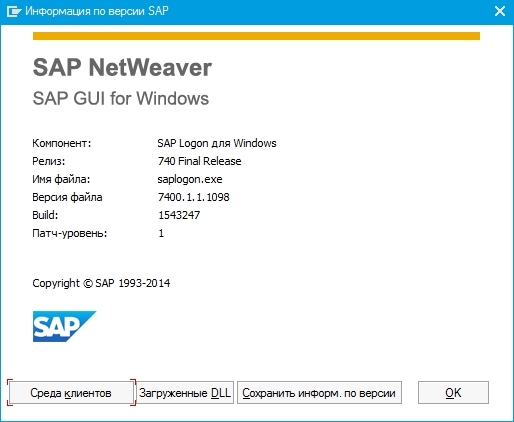 Вчера вышел SAP GUI 7.40. Предлагаю выявленные ошибки и недокументированные возможности фиксировать в этой теме. •Longer Lifetime: SAP GUI for Windows 7.40 is built with Visual Studio 2012 (which is supported until January 2018) - therefore SAP GUI for Windows 7.40 can be supported longer than release 7.30. SAP Blue Crystal is a new visual design theme which succeeds Corbu. It provides a consistent design that allows users to seamlessly experience SAP GUI and NWBC elements. It is the standard theme of Fiori applications and comes with a new color palette and icons which are better scalable. The background texture has a stroke pattern in white and light blue with a gradient layer. All SAP GUI icons used by SAP applications have been redesigned and are now fitting the Blue Crystal Design. Additionally they are much better scalable than before. The new set of icons is exclusive to Blue Crystal Design. SAP GUI for Windows can be embedded into NWBC 5.0, so that the user has one shell that unifies access to SAP systems. One desktop / taskbar icon consolidates NWBC and SAP GUI sessions, tasks, frequently used links etc. in a tabbed view NWBC frame. When SAP GUI for Windows 7.40 is installed together with NWBC, by default, SAP GUI and SAP GUI Shortcuts will be launched through NWBC. However, you have also the possibility to use SAP GUI and NWBC in parallel. To do so, you merely have so select the new component Install SAP GUI Desktop Icon / Shortcuts even though NWBC is installed to install the SAP Logon (Pad) Desktop Icon and to register SAP GUI shortcuts to SAP Logon. SAP UI Landscape unifies the persisted connection and configuration data from SAP GUI for Windows, SAP GUI for Java and NWBC in a modern and easier way through one single XML file. There are no more split configuration files for the different SAP GUIs like sapmsg.ini, entries in the Windows services file or saplogon.ini. The configuration files can either be stored locally or on a central server or share and the deployment is possible both via "pull" and "push" mechanisms. Note: At the moment, these new configuration features are only available when using SAP GUI together with NWBC. However, in the long run, this procedure will become the default for all SAP GUI installation and configuration scenarios. SAP GUI Screen Reader Extensions (SRX) are now part of the SAP GUI for Windows installation package. A new version of the SAP Calendar Synchronization for Microsoft Outlook is delivered with SAP GUI 7.40 for Windows. This version can be used with Outlook 2010. SAP GUI for Windows 7.40 is fully compatible with SAP GUI for Windows 7.30. Похожая проблема уже была (у одних - ок; у других - проблема со шрифтами) - патч помог. Возможно, и сейчас будет так же. Ну, в том случае мне не помогли ни рецепты из ветки, ни патч. Проблема решилась проще - сменой темы с дефолтной на Corbu, лишние пробелы сразу ушли. в некоторых элементах вставка текста из буфера обмена в левой кодировке происходит по shift-ins. в 7.30 всегда различий не было. У кого есть возможность, выложите файл на обменник. Спасибо! SAP GUI for Windows 7.40 Patchlevel 2 is available on SAP Service Marketplace! With patch 2 the main color has changed from blue to dark gray in order to harmonize the design with the Fiori Apps design. 1. 7.40 есть только в варианте для win64? 2. Интеграция с офисом - я так понимаю что 32битные версии офиса идут лесом? Currently there is no separate SAP GUI version for 64bit operating systems. However, due to the limitations mentioned in SAP Note 1442028, SAP currently evaluating the creation and delivery of a 64-bit version of SAP GUI for Windows (x64). This note will be updated once a development plan and shipment schedule have been determined. Due to the huge effort associated with creating such a version, a 64-bit version of SAP GUI for Windows will not be available until 2016 at the earliest.